This game draws all sorts of inspiration from a Norwegian slot machine called jackpot 2000. 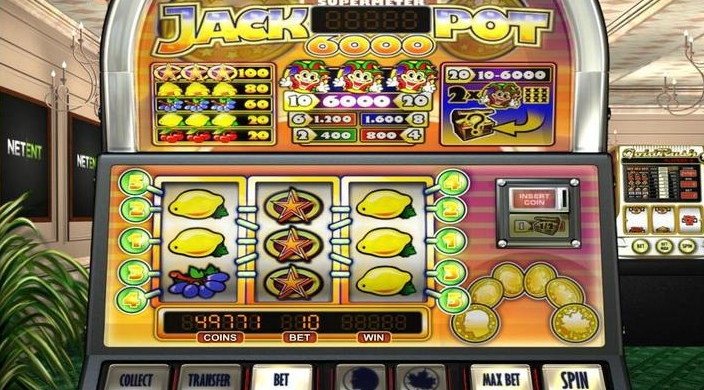 If you’re a lover of the original fruit based slot machine then you will feel right at home as you play casino slots online and enjoy the realistic spinning reels and the mystery joker cash rewards. To power and run successful casino, you need an extensive range of top performing content as well as a smart management tool. This is where NetEnt, a world leader in providing premium gaming solutions comes in. A true pioneer in driving the competitive market with thrilling games, NetEnt take pride in delivering flexible digital casino solutions. Easy slots are proud to partner with Netent. If you remember, and played, the old style, button push slots at the arcade, you will love Jackpot 6000. And if you don’t remember and have never played them, step back a little ways in time and see what all the fuss was about. A real blast from the past, Jackpot 6000 is sure to make you smile. Simple and faithful in reproduction on the play screen, this is classic slot play no one should pass up. There is no soundtrack, just the all important whirring of the three reels and the clunk, clunk, clunk when they stop. No wonder this is one of gaming giants, NetEnt’s most popular slots. In addition to the three reels there are five bet lines and a potential jackpot of 6000 coins. The background is a nice slot arcade with green plants and a green carpet. Another slot machine is in view, but you will only have eyes for the humble slot stand before you. Set your bets, ranging from 0.01 to 0.10, click the start button and reels begin. Getting back to basics, it is a fruit machine and its reels are dotted with fruity symbols including lemons, cherries and grapes, other symbols are stars, bells and a joker is wild. On events or wins, it comes to life with flashing lights and clanging bells the authentic sounds of the arcade you can still hear today in land based casinos. Most of all, it is a jackpot slot and when you launch the ‘Supermeter’ the real potential for the joker wild and the jackpot win comes into play. In ‘supermeter’ mode and providing you have opted for the maximum stake, should you land two jokers, you will receive and mystery prize. However, land three jokers and you’ll scoop the top prize - now you are in full supermeter mode and your stake will max out escalating to 20 coins and all five bet lines come to life. Learn more about how to pay with phone credit slots. They say you have to be in it to win it, and this is the case with Jackpot 6000. It means returning your winnings into play and playing at maximum stakes. After around ten minutes continues play, did land two jokers, twice. My mystery prizes were 250 coins and 200 coins. If you would things to move a little quicker in your quest for the 6000 payout, you can enable quick play and the reels literally jump from one combo to the next. On landing a win, you will be prompted to press spin for the ‘supermeter’ if you do this, your winnings then pay for your next set of spins, until they run out and the charges revert back to your coin balance. This isn’t a slot for the timid and if you decide to play at lower stakes, you may notice your returns are merely pocket change. So deep breath, gerd your loins and show Jackpot 6000 who is boss because landing three jokers will get you the big prize and crown you Jackpot Boss. We also often run various UK slots promotions with this game. An excellent and faithful rendition of the once very popular slot machine style that dominated land based casinos. Those seeking this kind of quick and easy play will love Jackpot 6000. It’s simplicity should please newcomers too although its core audience is likely to be the experienced, high rollers and those that thrive on and enjoy thrilling chase of the big win. We're sure you'll fall in love with this slot and if you did then you could also try Vikings Go Wild.